Soft soap with potash. 18 pounds potash to 12 or 14 lbs. grease - dissolve the potash in boiling water, & if the grease is clear put it in the cask & pour the potash on it. Then fill up the cask with soft water. If the grease has any scraps & bones boil them in weak ley -- that is ley made with the potash. 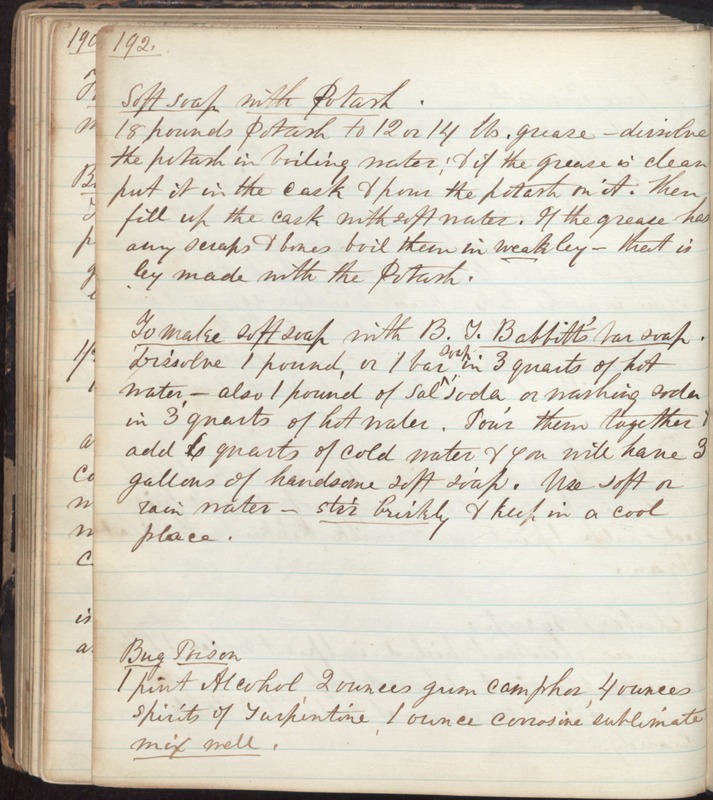 To make soft soap with B. T. Babbitt's bar soap. Dissolve 1 pound, or 1 bar soap in 3 quarts of hot water -- also 1 pound of sal soda, or washing soda in 3 quarts of hot water. Pour them together & add 6 quarts of cold water & you will have 3 gallons of handsome soft soap. Use soft or rain water -- stir briskly & keep in a cool place. Bug Poison 1 pint Alcohol, 2 ounces gum camphor, 4 ounces spirits of turpintine, 1 ounce corrosine sublimate. Mix well.